I'm not a robot. Seriously, I'm not! I don't see the point why I have to prove my humanity to you over and over again. How many times has this happened to you? You type in excitedly to give your favorite blogger a virtual high-five for her recent amazing post then this ridiculous "prove-you're-not-a-robot" prompt comes up completely ruining the moment. This word verification thing is really sucking the fun out of commenting. Sometimes it's the one thing that usually prevents me from letting a blogger know that I visited and read her post. I couldn't even decipher those two words 80% of the time! Anyway, I'm feeling really sorry for myself right now. When will I ever learn? Eventually got into the trendwagon once again and purchased an ebook copy of Fifty Shades of Grey the other day. I'm not even finished with Chapter One and I already lost count how many times this Anastasia Steele flushed. I'm telling you, this girl has some major flushing problem! She's either flushing, blushing or turning crimson almost in every page and it's driving me insane. It's unbelievable! I really think Fifty Shades of Flushing is a more appropriate title for this book. No longer sure if I can still will myself to finish reading the entire book. It's disappointing. What's worse is, I already got the trilogy because I thought I'll be saving tons if I got the discounted bundle. I feel like I've been duped or something. I had to keep reading, just wait until you get to the tampon part, it's so bad! I enjoyed reading that review! Thanks for sharing it with me. That was so spot on! It's hilarious and so true! I totally get the robot frustration - one of my email accounts actually does that to me nearly every time I send an email! I don't know if it's a glitch or what, but I've proved myself at least twenty times by now! And yeah, the writing in 50 Shades is pretty bad. I ended up reading the whole trilogy anyway, just because it was so quotable. Hopefully it'll pick up a little and you'll be able to finish the books! SOOOO with you on that robot thing. I never have issues with spam on my blog (knocking wood furiously) and the 50 Shades - UGH. I don't get it. I know a gazillion writers of all shades who are tons better than this hot mess who never get a sliver of a fraction of that attention. WHY? I don't get it. Oooh, love your blog - and not just because I instantly adore people who think like I do. YES! 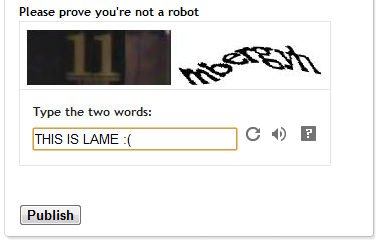 Because if I were a robot I would be able to READ those captchas! I hate them. they take so much extra time and i usually have to do them multiple times. and on a tablet? forget it! I haven't read Fiftey Shades of Grey. A few people have suggested it to me but it doesn't sound like something I'd be able to tolerate. You aren't the first person to tell me that there's a lot of repeated phrases in it and that really bothers me. I had to stop reading the Earth's Children series because of it. LOL, I am so with you on the robot thing. It's so annoying and nine out of ten times I can't even read the damn word that is spelled out. That way I cannot even prove I am human! I mean HeLlO! Haha Susie, sometimes I am like wait? AM I a robot? Because the words are so distorted they are sometimes unreadable! P.S. Susie I actually think your setting is on so when people comment on your blog they see the robot verification thing. See? It's totally a default setting on Blogger!! Oh my it is?! I had no clue!! Of with that thing it will be. Thanks ladies! Interesting post! I haven't read Fifty shades of Grey, but don't get where all the hype comes from. Im not even slightly interested in reading it. 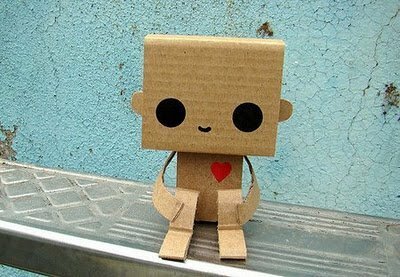 I like your blog :) I started following you! Oh gosh, I hate that prove you're not a robot thing too! I think google/blogger needs to disable it as the default since it's currently the default function when you start a blog. I wonder if a lot of people just don't change it. I had it at the start, but seriously if bloggers are worried about comments, they should just moderate! Haven't read 50 Shades of Grey and have no intention of doing so. Yikes. I read a bit of it in the book store. I thought it was poorly written and had no desire to read any more. The robot thing is the bane of my existance! There are times when I just give up and close the window without leaving a comment because it is so darn hard to read. I don't get that much spam and the little I do get I can delete with little difficulty. i wish i really read the reviews first before diving in. it's poorly written and i couldn't agree more with "Fifty Shades of Terrible".